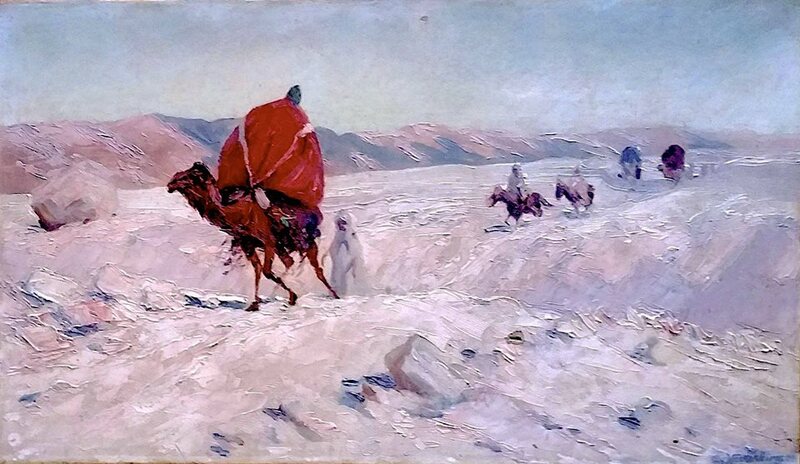 Titled: Caravan through the Algerian Desert. The artist Ernst Weckerling was active / lived in Germany. The Algerian Desert (Arabic: الصحراء الجزائرية) is a located in north-central Africa and is part of the Sahara Desert. The desert occupies more than four-fifths of the Algerian territory. Its expansion starts from the Saharan Atlas, more or less as a stony desert and the farther inland you get the more of a sand dune desert it becomes. In the southwestern parts is the mountain range Tassili n’Ajjer located. This area is a subject of great archaeological interest and was put up on the “World Heritage List” by UNESCO in 1982. The area is known for extreme aridity and extreme heat, as daytime temperatures are commonly between 46 °C (113 °F) and 51 °C (122 °F) during the hottest period of the year in most of the desert. Cities and towns such as Ouargla, Touggourt, Beni Abbes, Adrar, In Salah are among the hottest places on the planet during the height of the summertime. Annual average rainfall is well below 100 mm (3,93 in) in the northernmost part but the center and the southern part receive much less than 50 mm (1,96 in) and are therefore hyper-arid and among the driest places on Earth.